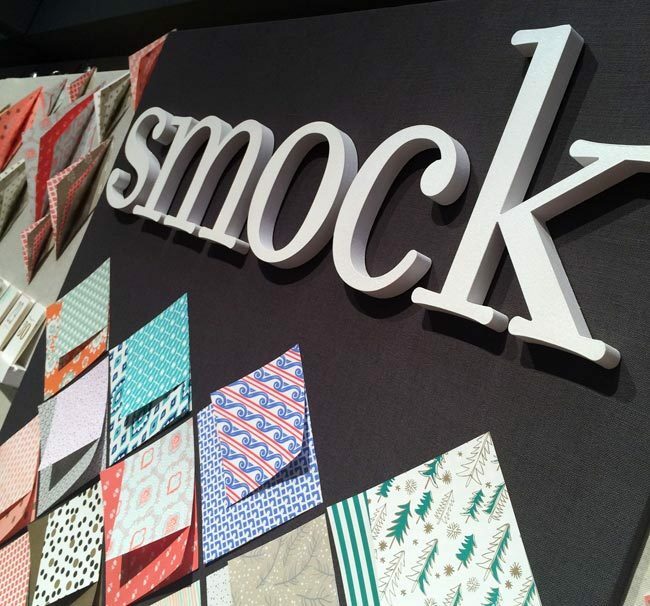 National Stationery Show - Smock. 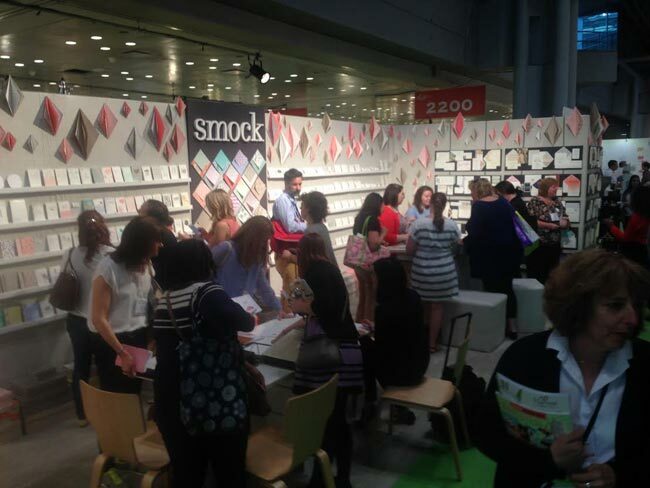 We’re back from another successful year at the National Stationery Show! 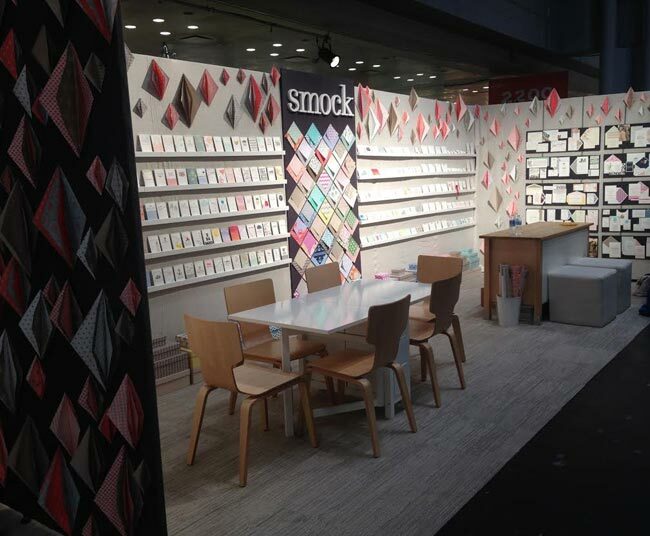 This year we moved to a larger space, so we took advantage of the opportunity to redesign our booth. 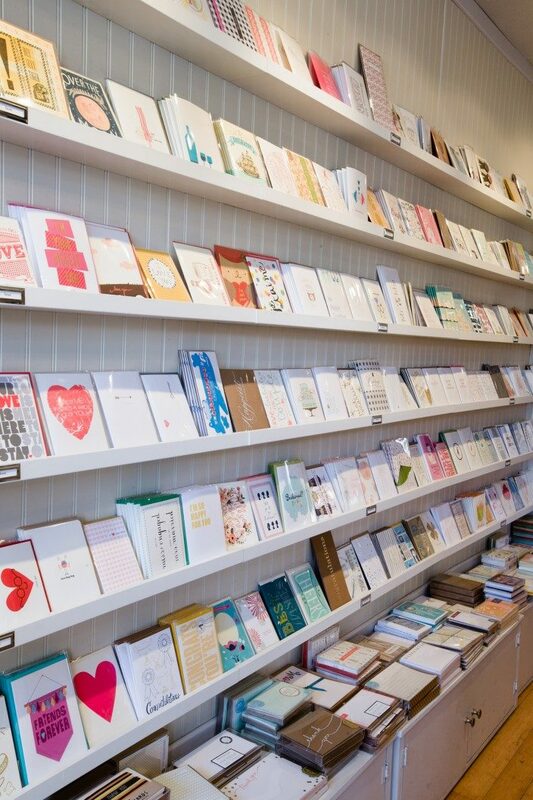 We wanted the space to feel open and inviting, so we created a back wall the ran the entire length (40 feet) of the booth, with both ends open and accessible. 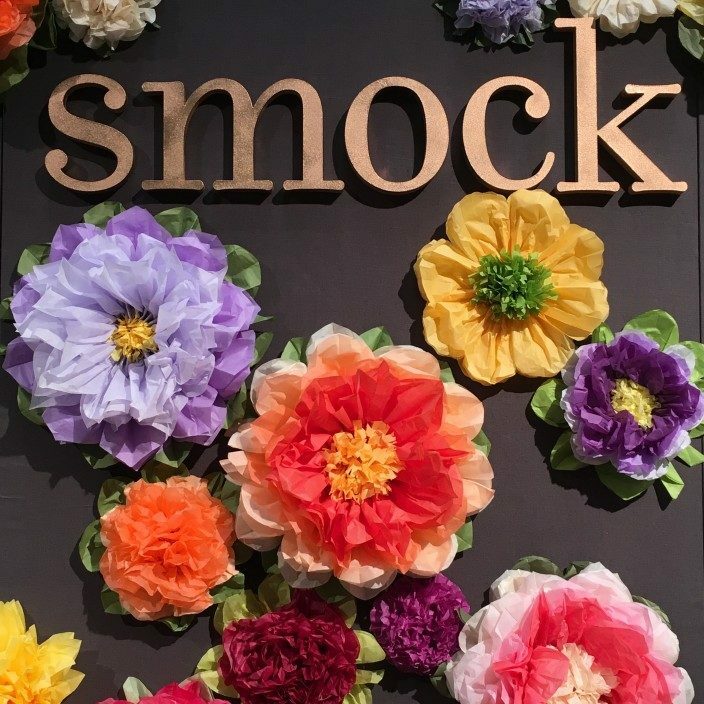 The back wall of the booth was covered with a textured charcoal fabric, to which we adhered our product samples — the dark background really made everything pop! 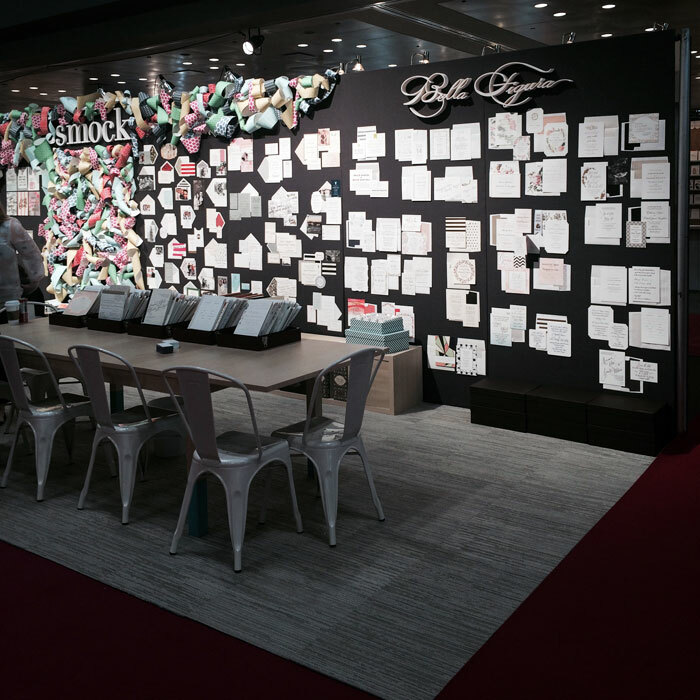 When it came to our favorite part — the decorative elements — we drew inspiration from some of our new cards and opted for a party-like theme, creating enormous ribbon curls with our gift wrap that spanned the length of the booth and covered an entire panel of our display. 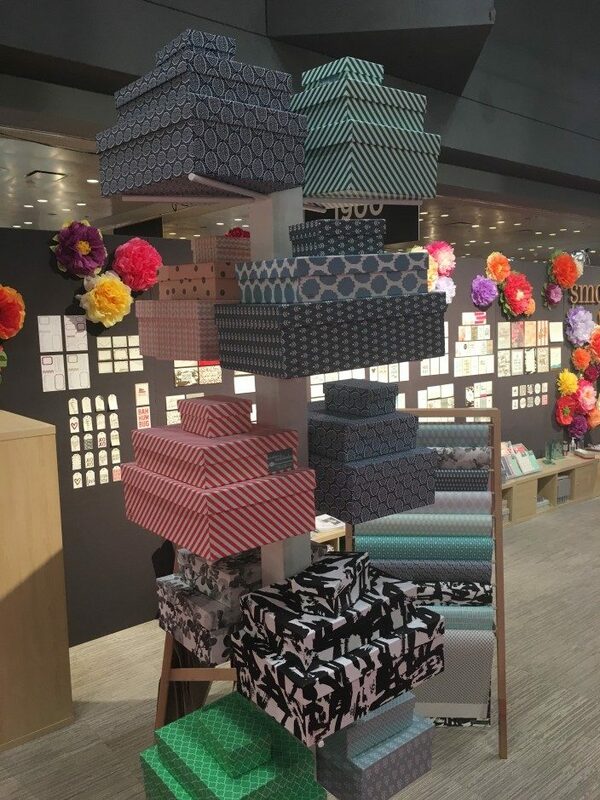 We created a custom box tree to showcase our nested sets of keepsake boxes, and perched flags with our booth number on top so that we were easy to spot from a distance. 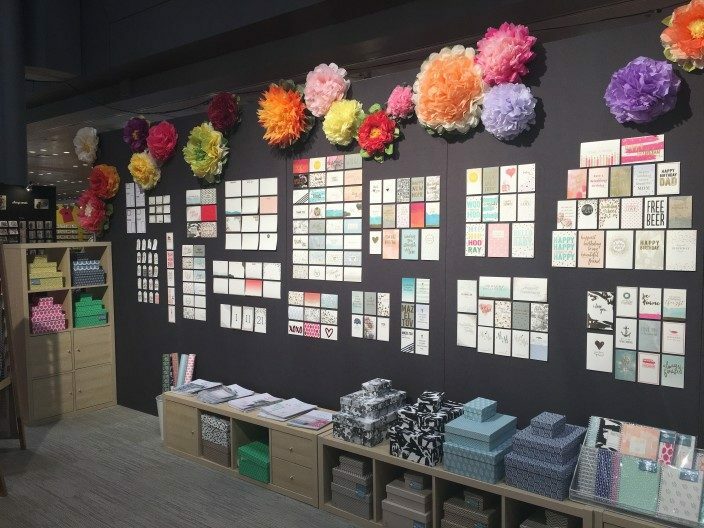 Every year debut a variety of new products at the show, and this year was no exception: we introduced new gift wrap patterns and keepsake boxes, lots of new cards, calendars, art prints, coasters, gift tags, and more. 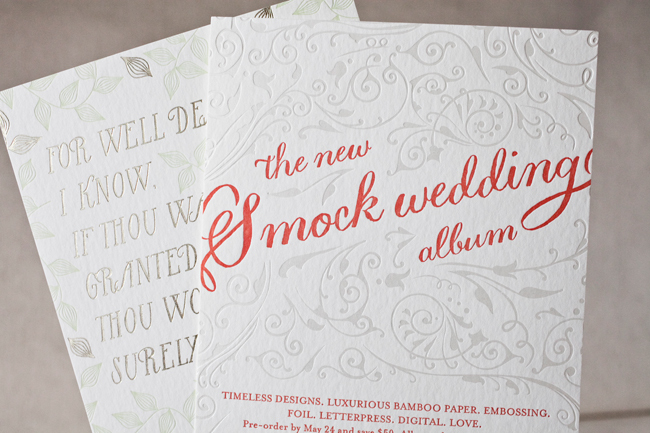 We also launched two new albums at the show: Smock Wedding Volume 6, as well as our first ever Holiday album. 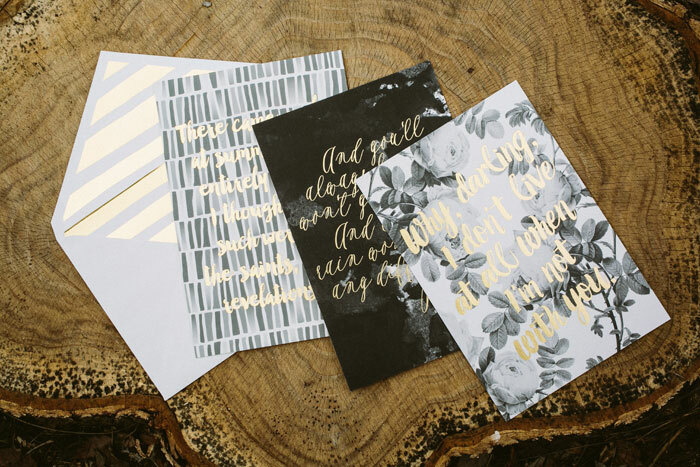 These new custom designs, as well as our new Everyday offerings, will be available on our website soon! 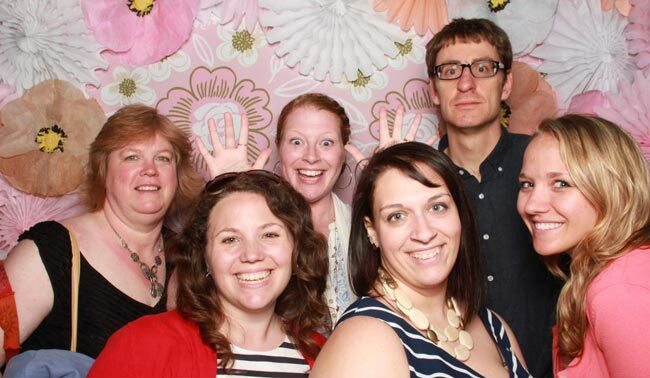 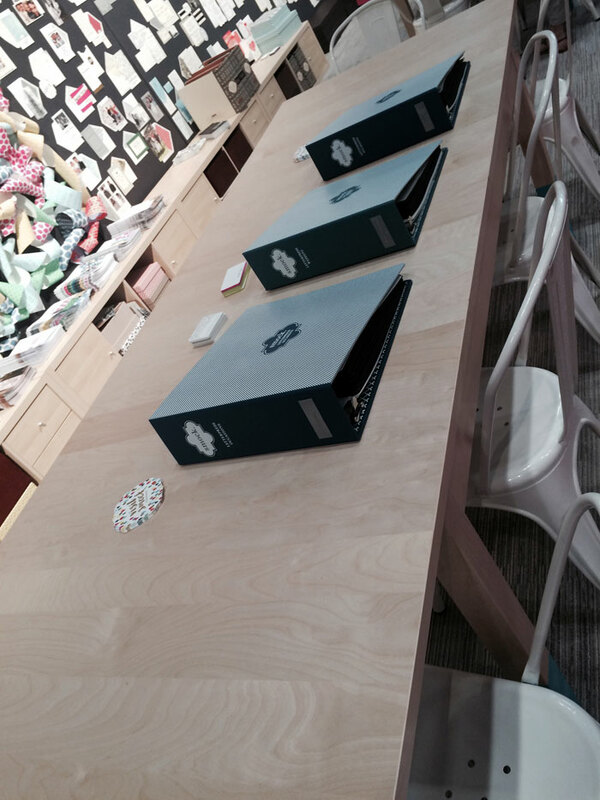 In addition to the 2015 National Stationery Show, we were excited to be a part of another event: Paper Party! 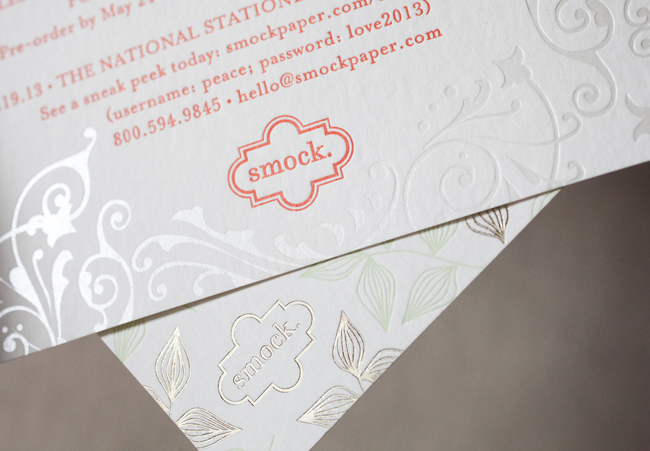 Smock sponsored the amazing event, which is hosted each year by Oh So Beautiful Paper. 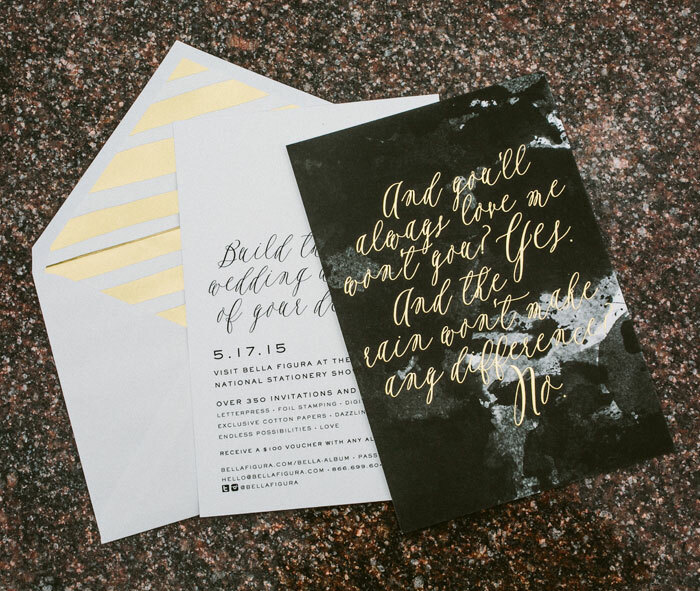 Our BFF Bella Figura printed this year’s invitations, and we created paper chandeliers to help decorate the event. 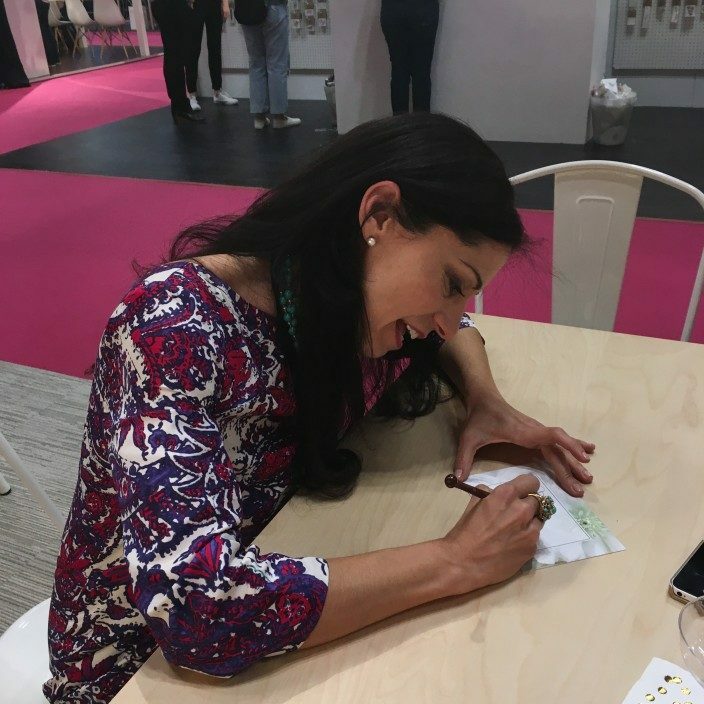 Many thanks to Nole at Oh So Beautiful Paper to inviting us to be a part of the event, and thanks to all of our amazing dealers who made time to see us at the show! 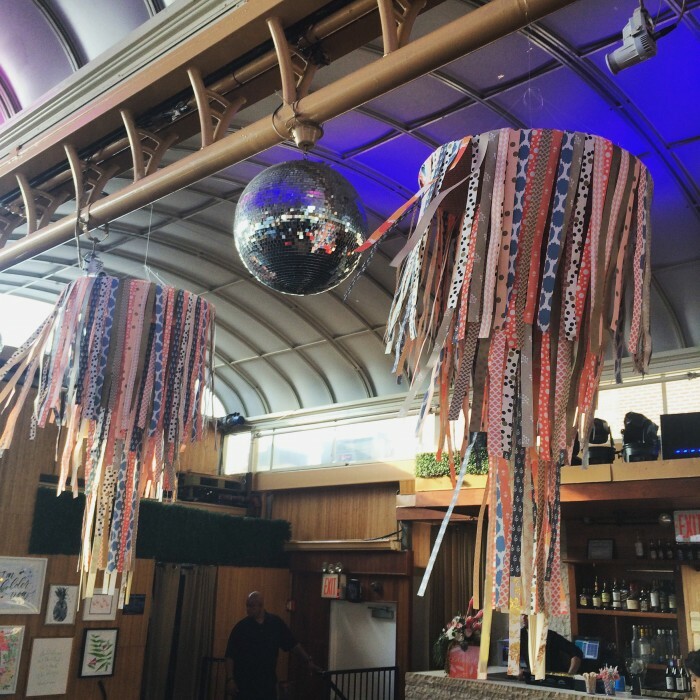 We can’t wait for 2016! 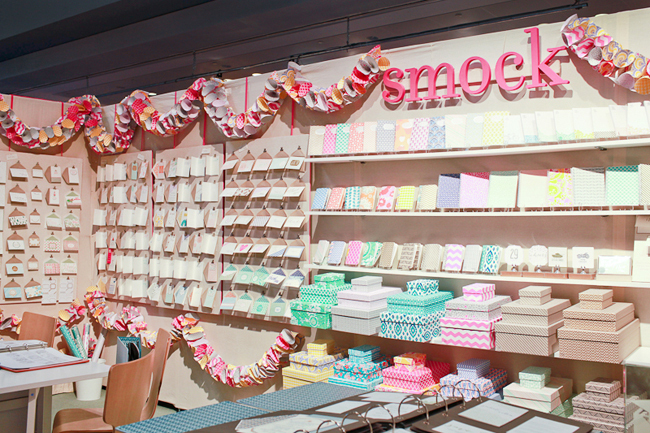 It’s almost time for the 2015 National Stationery Show! 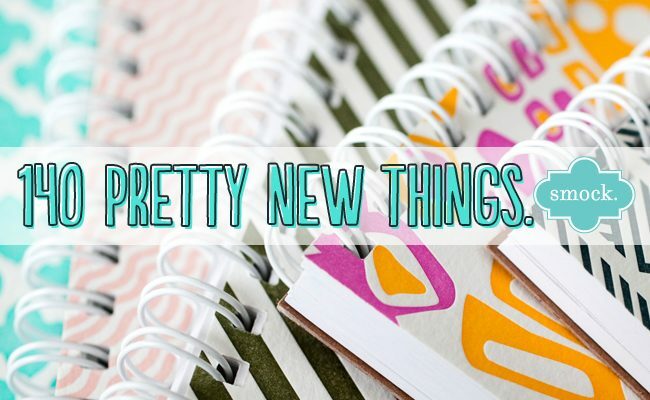 To kick things off, we recently sent out announcements to spread the word on our new offerings for this year’s show. 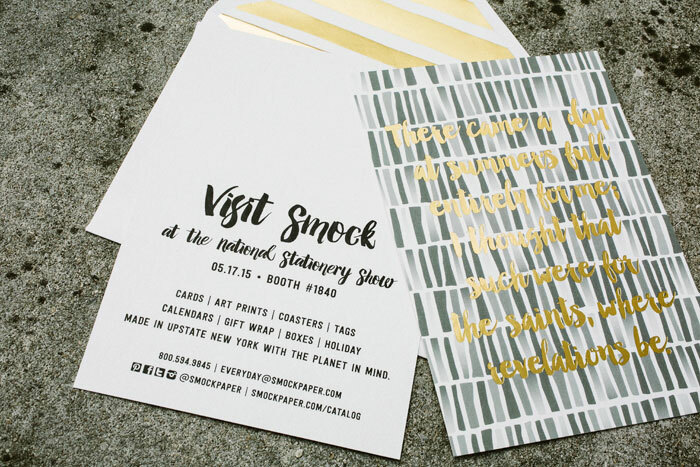 We chose a sophisticated color palette of black, white, and gold matte foil, and created informative cards that doubled as art prints. 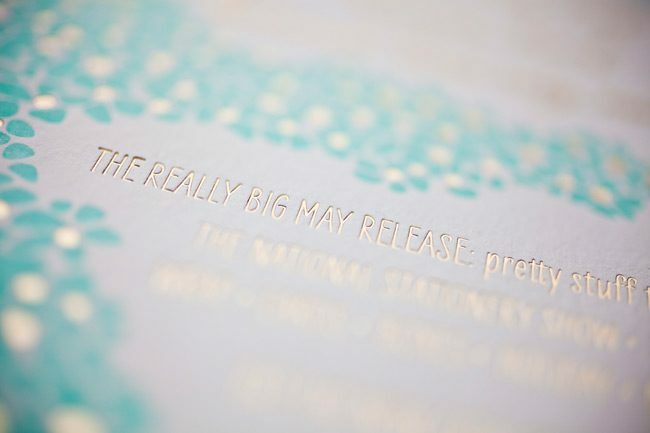 Our new foil stamped envelope liners made their debut, and we purchased some gorgeous postage stamps from the USPS as a finishing touch. 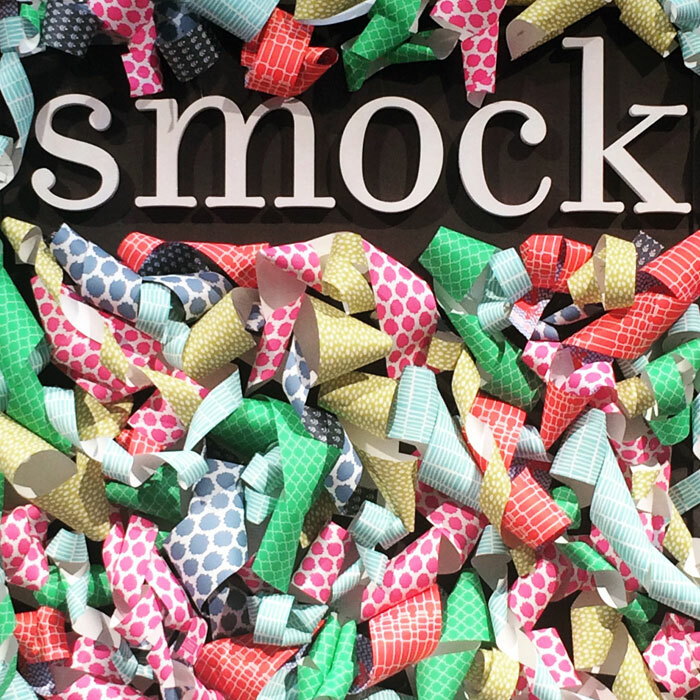 We hope you’ll come see us at the show — we’ll be in booth #1840! 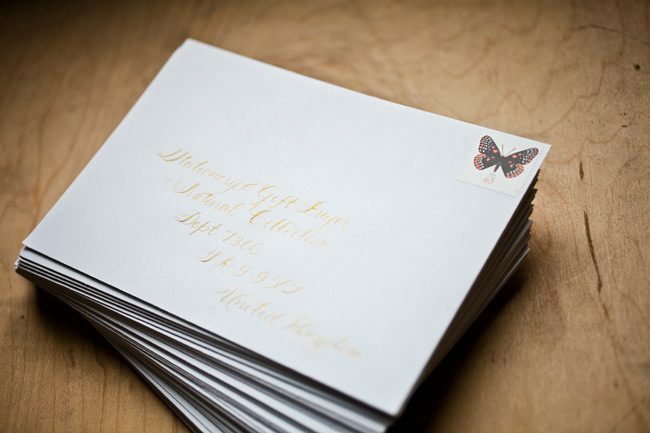 PS: check us out on Instagram to catch a peek at the postage stamps we used on the envelopes! 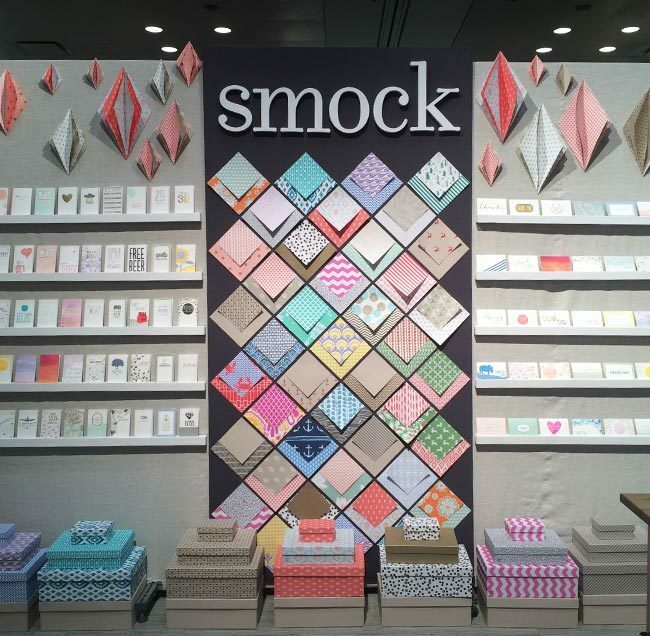 We’re back from our annual trip to the National Stationery Show, where a handful of members from the Smock team enjoyed a fun, paper-filled week and got the chance to see a lot of our amazing retailers! 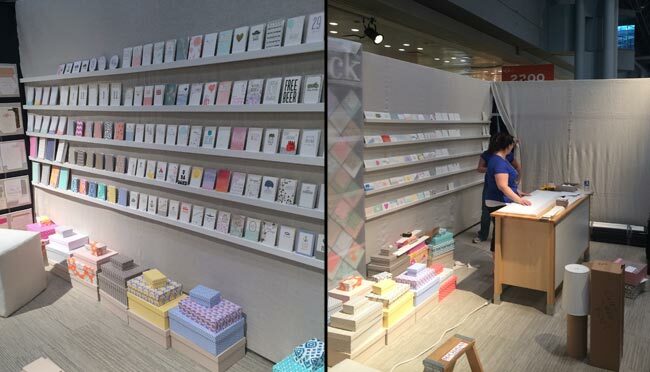 We made some changes to our booth design this year, switching from large, panel displays to sleek shelves for our greeting cards, and selecting new fabric and carpeting. 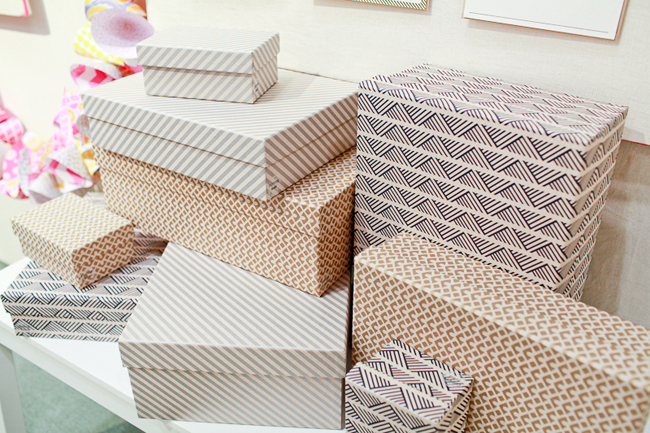 One of our favorite changes for this year was our decorative gift wrap display! 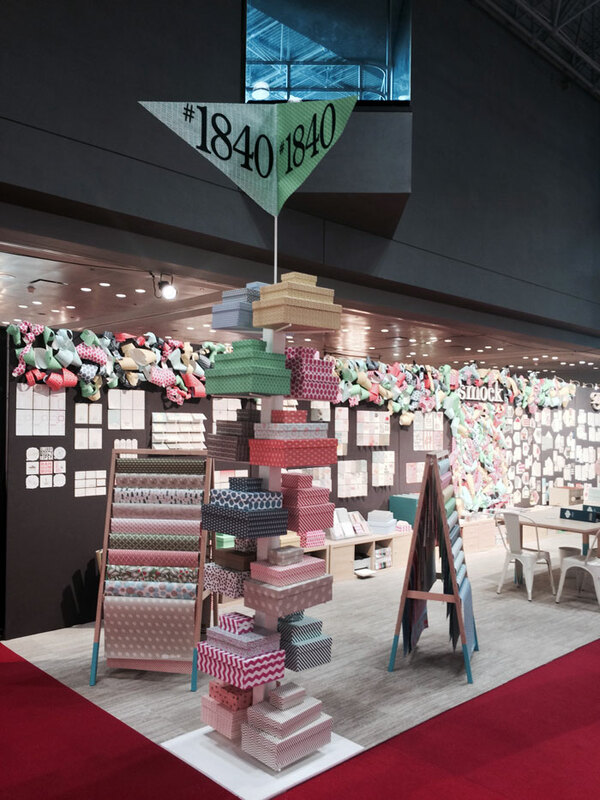 Each year we also create a decorative element to dress up our booth, and for this year we decided to make decorative diamonds using our new gift wrap. 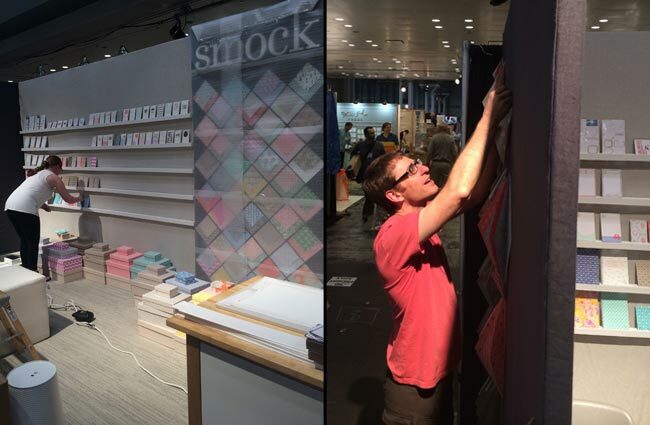 Check out some of our shots from set-up and the finished booth! 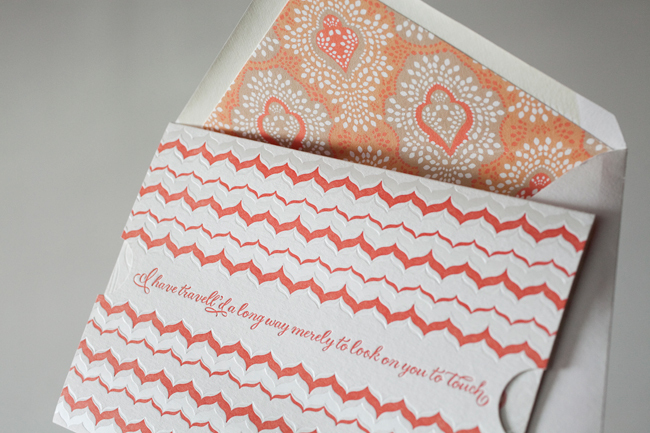 We were also honored by the Greeting Card Association with our third (!) 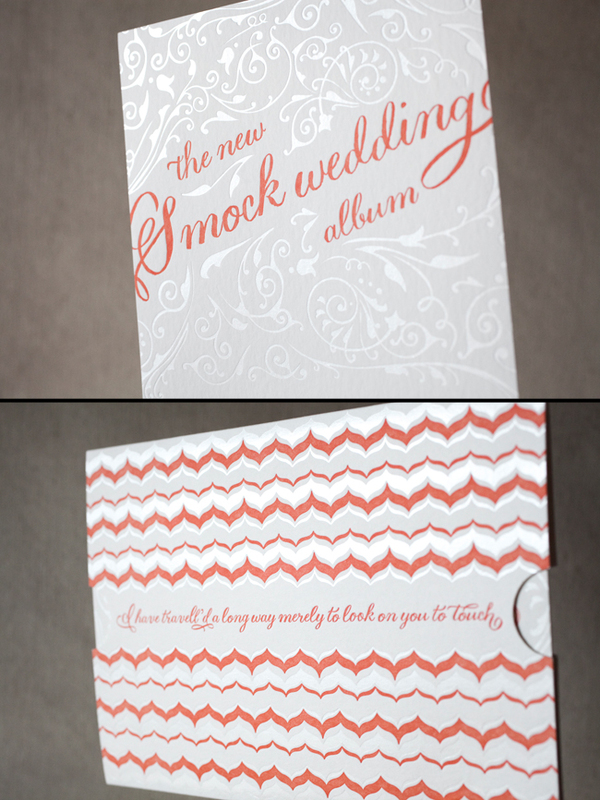 Louie Award for our “Elfing” holiday card in the humorous holiday card category $3.50 and up. 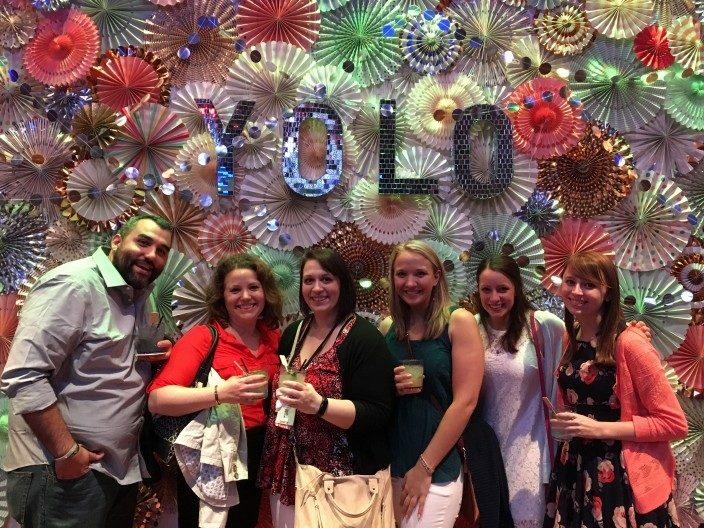 The GCA put on an amazing gala for the Louie Awards, which featured a cute candy theme (check out those giant gumdrops!) 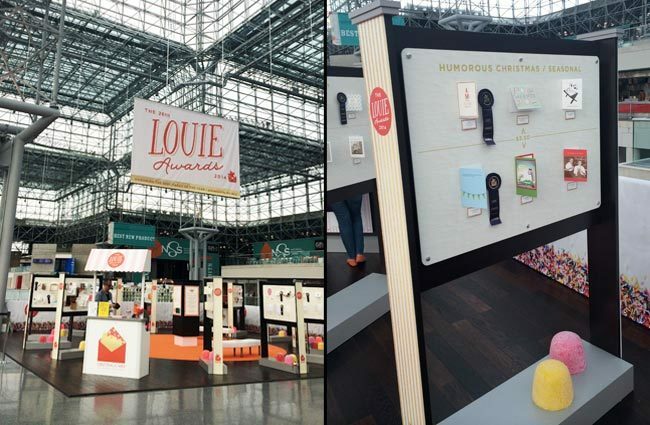 that was also present in the Louie Award Exhibit at the Javits Center during the show. 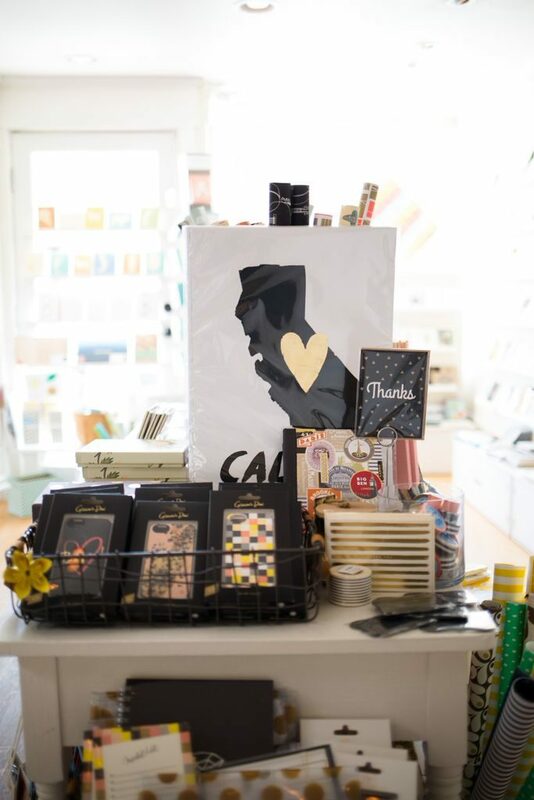 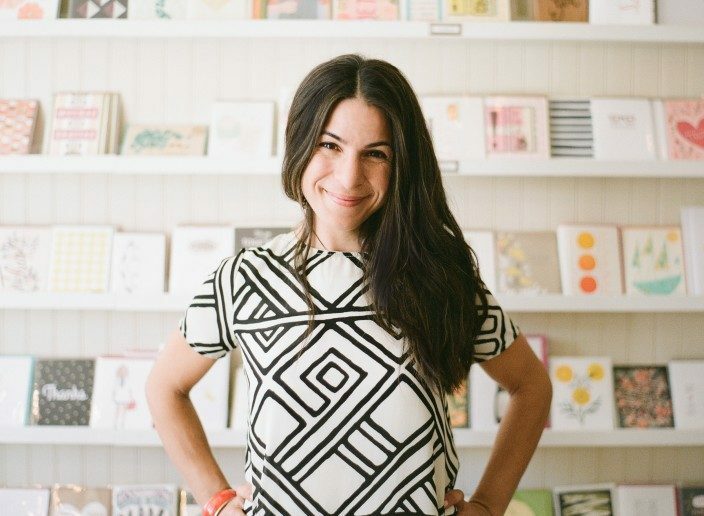 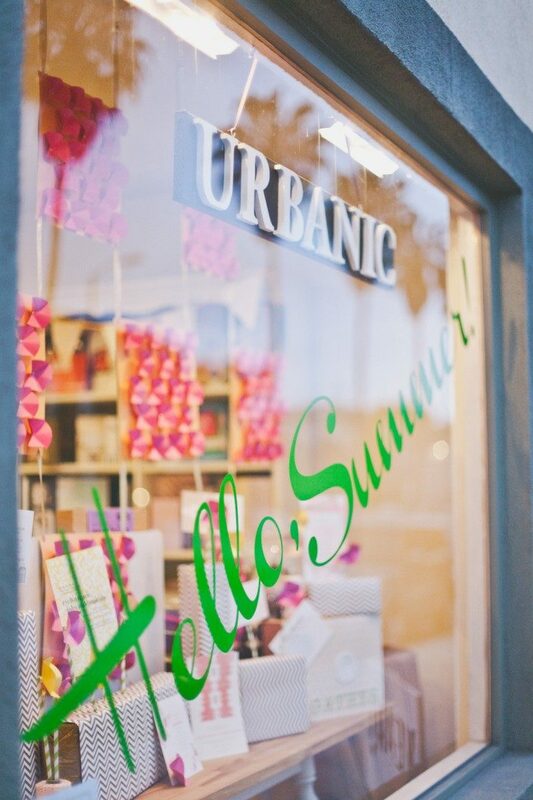 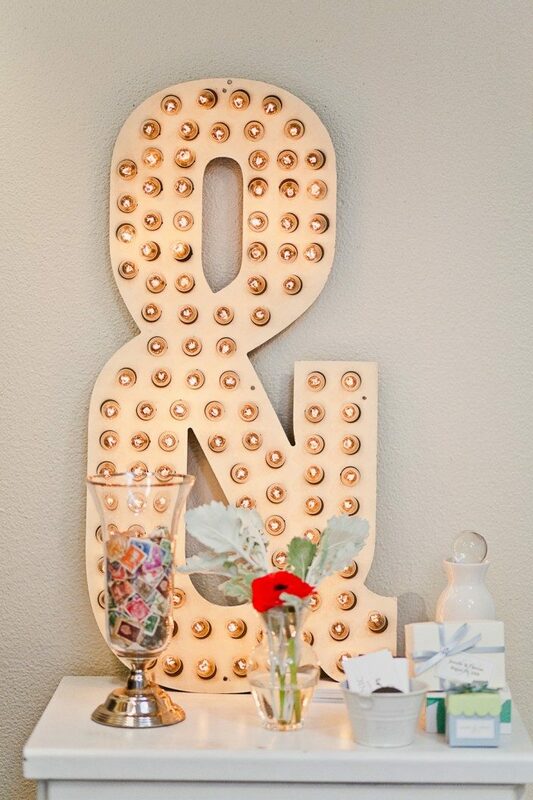 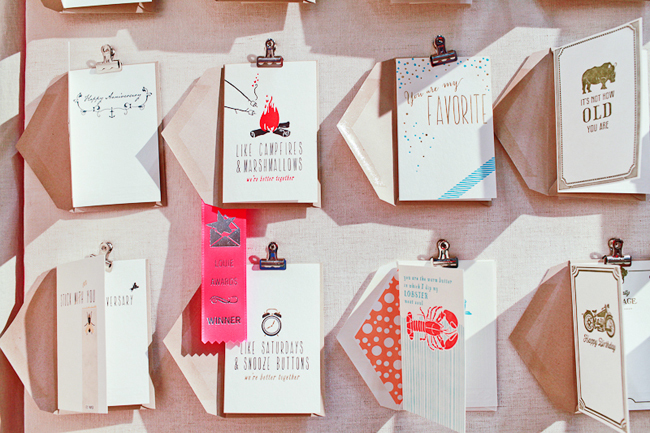 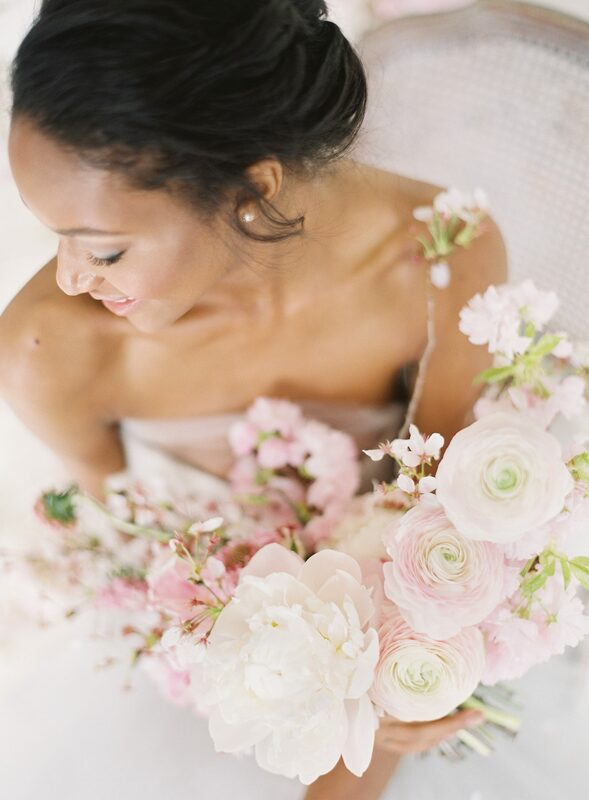 One of our favorite things about the Stationery Show? 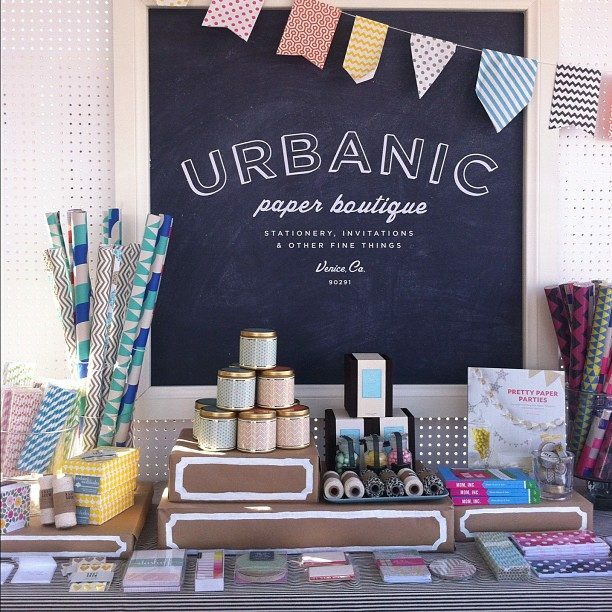 Paper Party! 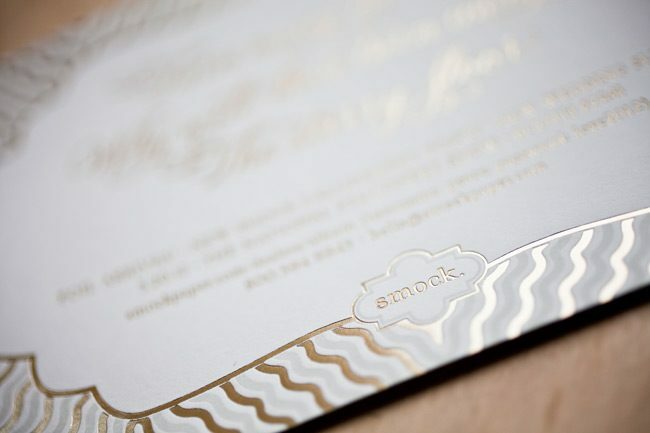 We were sponsors again this year for the Oh So Beautiful Paper 2014 Paper Party, and we had the pleasure of collaborating with Mohawk Paper and Mr. Boddington’s Studio to create the invitations for the event. 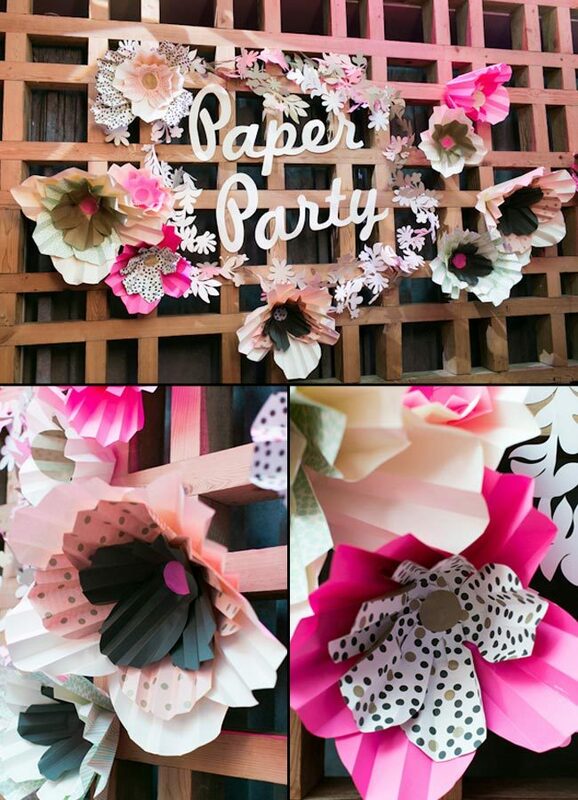 Our gift wrap was even used to make giant paper flowers for some of the Paper Party decor! 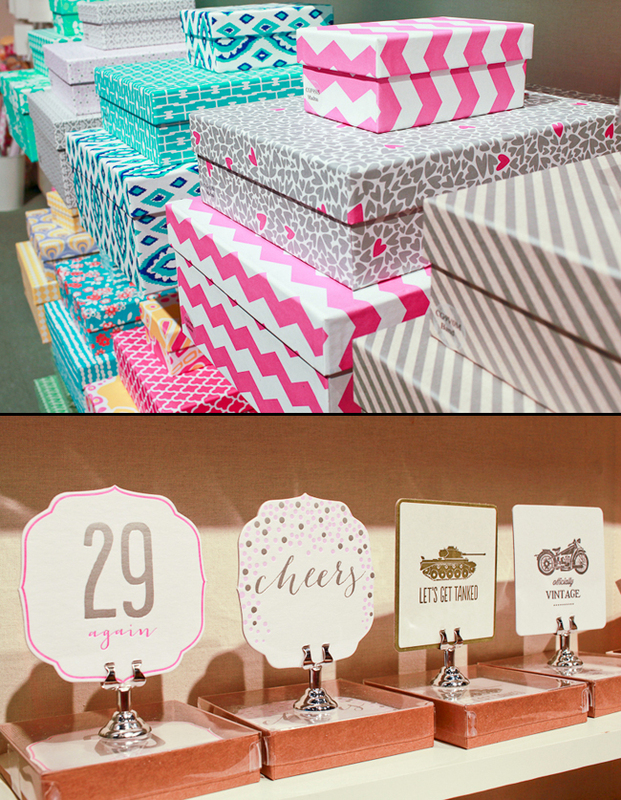 Be sure to check out our new arrivals to see all of the new cards, gift wrap, boxes, and more that debuted at the show! 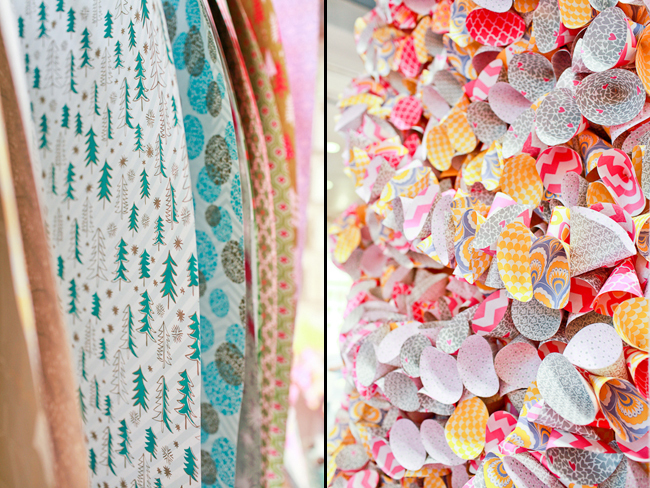 Many thanks to everyone who stopped by to say hi at our booth! 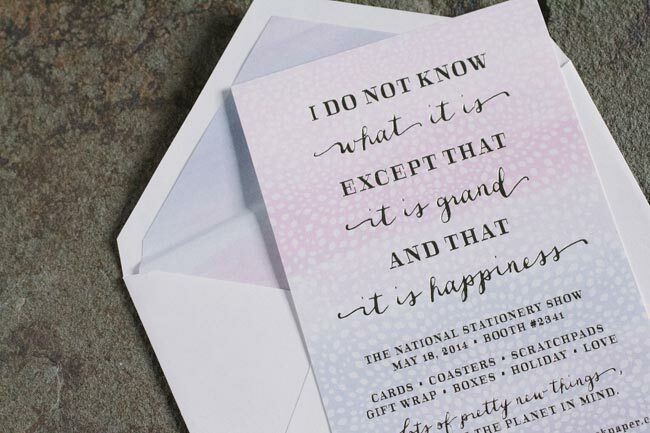 We’re hard at work with last minute preparations for the upcoming National Stationery Show, but we had to take a minute to share our 2014 National Stationery Show invitations. 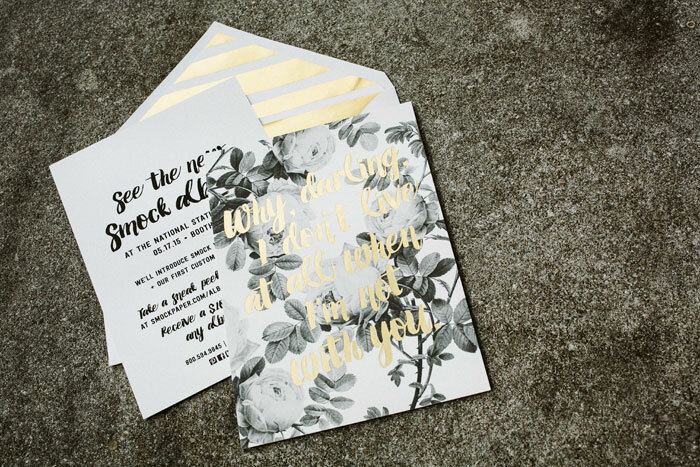 We’re loving the look of digital printing paired with foil stamping, so this year’s set included one of our vintage print patterns and a new watercolor fade pattern with tawny matte foil! 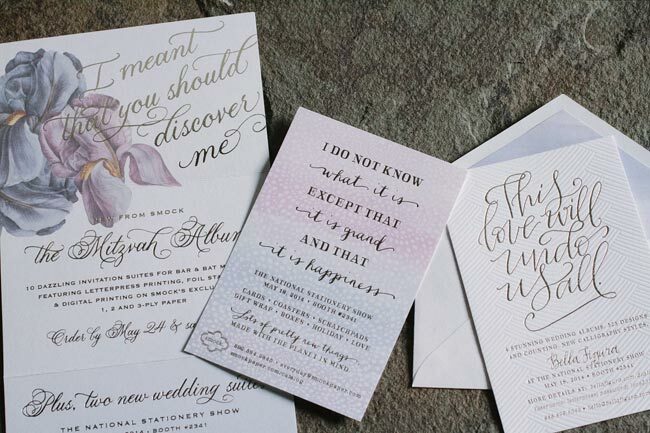 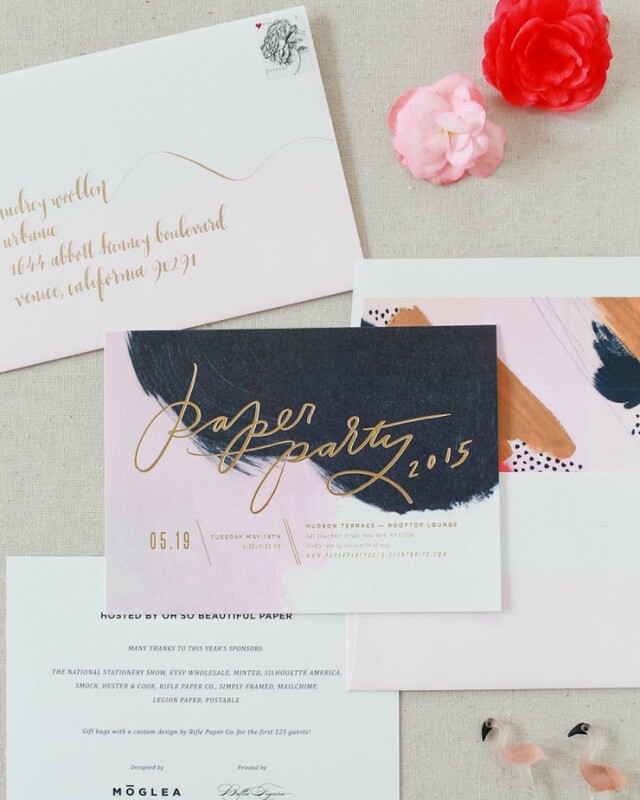 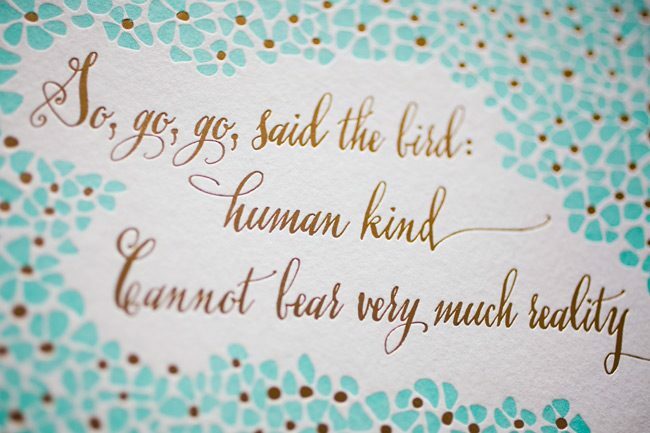 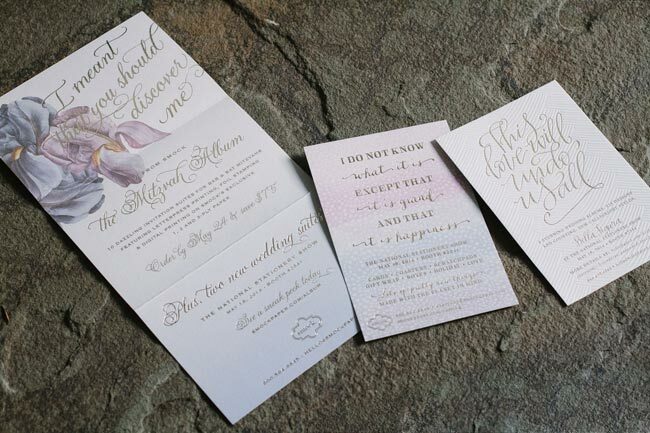 A watercolor envelope liner tied the invitations together. 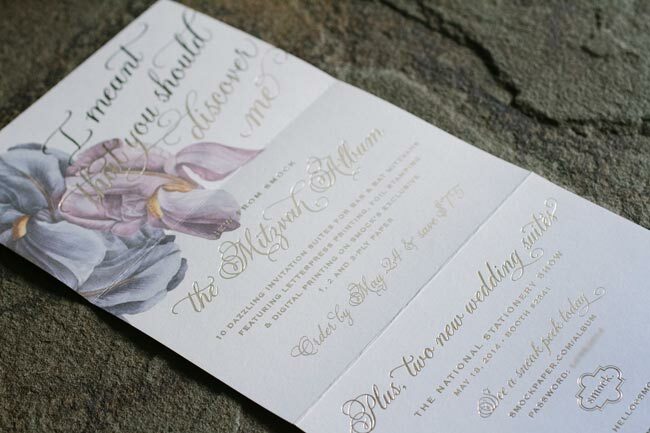 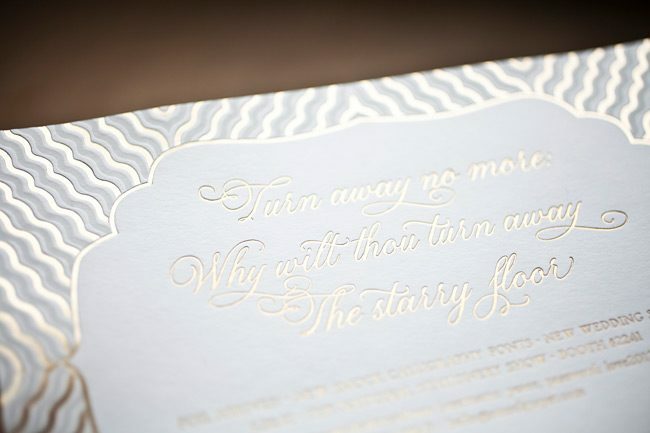 Our BFF Bella Figura will be making an appearance at the show this year, so we printed a beautiful blind debossed invitation with tawny matte foil and custom hand calligraphy accents by Elizabeth Hardin on Bella Figura’s rich cotton paper. 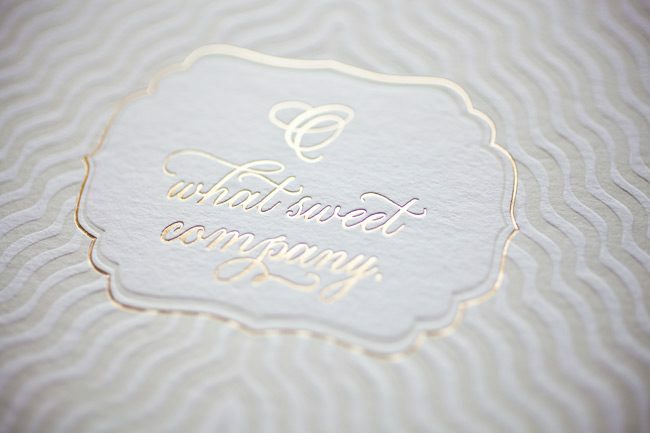 We’ll be launching a brand new Mitzvah album at the show, along with lots of new Everyday products, so be sure to stop by our booth – #2341 – to say hi!